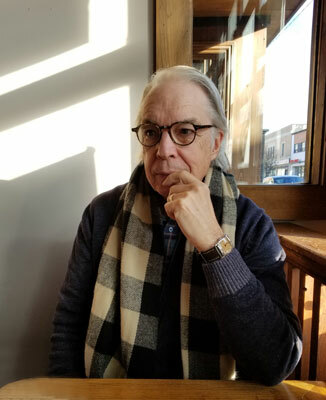 R anked among Canada’s leading literary journalists, Wade Davies Rowland has written more than a dozen books on subjects ranging from television journalism, organized crime, and international environmental law to his current concerns, which include communications technology, the philosophy of science, and technology and human values. Rowland was born in 1944 in Montreal, Quebec, where his father was posted for wireless training in the RCAF in the closing months of World War 2. He grew up in Regina, and moved with his family to Winnipeg as that city was recovering from the disastrous 1954 flood. His prairie roots run deep: grandparents on both sides were pioneering farmers in the North Battleford area of Saskatchewan. His maternal grandfather, Charles Davies, was a Progressive Member of Parliament for North Battleford; his brother Douglas was an NDP Member of Parliament for Winnipeg North. Rowland’s life-long interests in writing and in communications technologies developed in parallel: he passed the examination which qualified him for his amateur radio operator’s licence on his fifteenth birthday and in the same year made his first attempt at a full-length work of fiction. His newspaper career began when he dropped out of the final year of an Hons. BA program in economics at the University of Manitoba to accept a reporting job with the Winnipeg Free Press. At the Free Press he quickly showed a flair for what would come to be called enterprise journalism. During an investigation of a Winnipeg police department goon squad assigned to harass transient young “hippies,” Rowland himself was attacked, and he launched a high-profile lawsuit which led to reforms in the department. The notoriety he achieved in this episode landed him a job at the Toronto Telegram, where he became the newspaper’s specialist in organized crime and environmental issues, winning awards in both areas. When the Toronto Telegram ceased publication in 1971, Rowland launched the freelance writing career that he has pursued intermittently for more than thirty years. His first books (The Pollution Guide; The Plot to Save the World: The Life and Times of the Stockholm Conference on the Human Environment; Fuelling Canada’s Future) dealt with environmental issues and are recognized as having played a role in raising public awareness of the then-novel subject of environmentalism. In the mid-1970’s Rowland was recruited by CTV television news, where he worked initially as assignment editor and later as lineup editor for the network’s flagship national newscast. The association with CTV would continue for fifteen years, during which time he continued writing books (Making Connections, Nobody Calls Me Mr. Kirck (with Harvey Kirck), Polar Passage (with Jeff MacInnis)). He was eventually made Director of Policy and Development at CTV, in which position he wrote and produced the network’s policy and style manuals, and managed strategic planning for the news division. It was at CTV that Rowland met his wife-to-be, Christine Collie, who was art director for television news. They were married in 1978 and have two children, Hilary and Simon. Since their marriage, Christine has played an active role in Rowland’s writing career, providing professional photography for his travel writing, and design consultation on his books. After a brief attempt at living aboard an ocean-going sailboat, they cleared land and built a house on a wooded property in Hope Township near the historic town of Port Hope, Ontario, where Christine operates an internationally-known Web site development and SEO/business strategy firm, Blue Cat Design. Rowland has also worked for Canada’s public television network, CBC, where he has been Senior Producer of the consumer affairs program Marketplace (1984-86) and a senior executive in the network’s television news division, charged with strategic planning (1993-95). Farley Mowat, a long-time Port Hope resident, asked Rowland in 1986 to collaborate with him to fulfill a contract from Warner Books for a biography of Diane Fossey, one of the famous “primate ladies” recruited by Louis Leakey to study gorillas, chimpanzees, and orangutans. Research took Rowland to the U.S., Germany, and the U.K, and with his wife Christine acting as photographer, to Rwanda, in search of interviews and documents. The book was published in Canada as Virunga: The Passion of Dian Fossey, and in the U.S. as Woman in the Mists: The Story of Dian Fossey and the Mountain Gorillas of Africa. In 1996 Rowland returned to writing full time with Spirit of the Web: The Age of Information from Telegraph to Internet, an ambitious project to chronicle the development of communications technologies and their impact on society. The Globe and Mail newspaper called it “remarkable” and “required reading.” In the course of researching Spirit of the Web, Rowland became involved with the McLuhan Program on Culture and Technology at the University of Toronto, and would later edit and write the introduction to program director Derrick De Kerckhove’s book, Connected Intelligence. The longstanding interest in the history and philosophy of technology which saw fruition in Spirit of the Web, combined with his experience as an executive in large corporations (CTV and CBC), led Rowland to further explore the relationship of humans and human values to technology, in what would become the ground-breaking travel/philosophy book Ockham’s Razor: A Season in France in Search of Meaning, published in 1999. Another book on these general themes followed: Galileo’s Mistake: The Archaeology of a Myth (Thomas Allen Publishers, October, 2001). In this book, Rowland examines Galileo’s confrontation with the Church of Rome from the perspective of late-twentieth-century scientific and philosophical insights into the nature of reality, in a narrative which includes stories of journeying through Tuscany and life in Rome. In 2013 Rowland wrote Saving the CBC: Balancing Profit and Public Service (Linda Leith Publisher), an impassioned defence of the idea of public service broadcasting, and a critique of commercialization of the CBC. He followed this with a longer and more detailed treatment of the same subject matter in his book Canada Lives Here: The Case for Public Broadcasting. Rowland was Maclean Hunter Chair of Ethics in Media at Ryerson University in 2001-3. He earned an MA in the philosophy of science from Trent University in 2003, and a PhD from the joint Ryerson-York University graduate program in Communication and Culture in 2005. In 2006 he became an Assistant Professor in the Department of Communication Studies and the Faculty of Graduate Studies at York University in Toronto. He was made a tenured Associate Professor in 2011. He retired from teaching in 2018. His scholarly work has appeared in a number of academic journals including Journal of Corporate Citizenship, Journal of Corporate Ethics, International Journal of Media and Cultural Politics, and Social Epistemology. Rowland continues to write: his most recent work, You Can’t Get There From Here: Utopia, Technology, and Morality, is scheduled for publication Spring, 2019. He remains actively engaged in issues of public policy in broadcasting and media, and in advocacy for Canada’s public broadcaster.